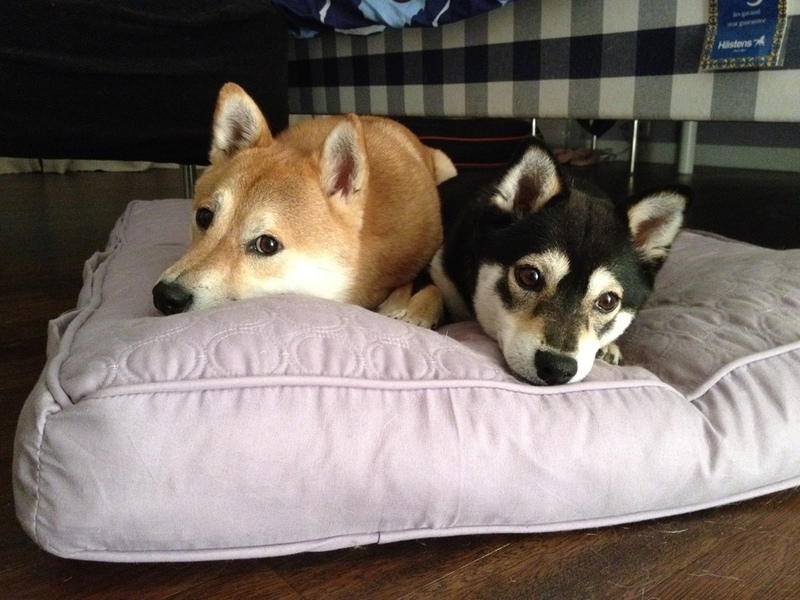 We frequently receive questions from single Shiba homes on what life is like with two Shibas. It's very difficult to answer because every family's experience is dependent upon the Shibas brought into the home. The only way that we can describe it is to share the way that we experienced it. To the best of my ability, here are the synopses of our experiences based on what I perceive as the most important topics that need to be addressed upon introducing a second dog into your home. This is very important because it sets the tone for the relationship of the two dogs in the beginning. Emi came to us as a foster and we met outside the neighborhood dog run so that it was a 'neutral' setting. This means a meeting point outside of what your resident Shiba considers his resting location or home base. We never met Emi before and had no idea what her personality would be like. That day, an NYCSR volunteer transported a few Shibas so I wasn't the only person there to pick up a foster dog. Seeing that one of the foster humans needed a ride home, I offered to drive her and her foster dog home after dropping Shio off inside the house and took Emi with me. When I returned home, I allowed Emi to enter the home directly without the need for another introduction in a neutral area because she was just spayed and very delicately shy. Knowing that Shio is sensitive towards wounded animals, I knew that he would be respectful of her space. Under my supervision, Emi cautiously sniffed the home while Shio and I gave her space to explore. Shio maturely controlled his excitement towards the new animal in his home. When she finally finished sniffing her new home, Emi laid down in the living room to rest and that's when Shio started begging her to play with him. Unfortunately for Shio, after the long journey to Brooklyn, Emi was exhausted and closed her eyes to sleep under our media stand instead of reciprocating his request. It's important that I disclose that this was how I chose to introduce them because of what I assessed of Emi's and Shio's personalities. Had Emi been a hyper puppy with no concept of boundaries or respect towards older dogs, Emi would've entered the home in a different manner. It's likely that instead of allowing both parties to have free reign of the home and freedom to go up to each other as they pleased, they would've been leashed and baby gates would be put to full use until they adapted to each other. In terms of budgeting money for food, we basically doubled what we normally spend for food. Emi eats the same amount as Shio because she has more energy. Shio is the worst at walking on a leash. He frequently protests when he doesn't want to go the direction you want to walk or if he's not up for walking. Emi was a dog that didn't even know what a collar or leash was until she came into our home. She also refused to walk because everything about Brooklyn sounds frightened her. If I had to do it over again, I would've made sure that Shio was trained to walk on a leash like a champ before we took in a foster. There's really no sight funnier than a person walking two dogs who refuse to walk. Except if you're that person who has two dogs who refuse to walk! Initially, Emi would only walk to hide under cars or sit and refuse to budge altogether. Sometimes, she would wrap herself around sign posts and be amazed when she tethered herself to the post. After she was comfortable with the sensation of a harness/collar and leash, we started off with short walks to the dog run so that Emi could sit and take in her new surroundings as she pleased. It took a month for her to be comfortable enough to move away from sitting on the picnic tables in the dog runs and run around chasing tennis balls but she loved the dog run so much that eventually we moved onto a different park so she could gain more confidence. When Josh and I were together, we'd each walk one dog. When it was just me, I had one leash in either hand for easy control of two dogs who enjoyed protesting. After time I learned to walk both dogs with one hand and used a coupler. However, we changed to having the dogs on one leash each because it's easier to control the dogs when they're on separated leads. For instance, if one was misbehaving, instead of pulling the coupler to grab both their attentions, I'd pull my hand left/right or foward/back to grab the attention of the offending party since the offending dog's leash would likely be the one that's taut. Emi was housebroken when she came to us but was on both a pee and poop strike for the weekend from stress. We went out for walks every two or three hours just as we would've with a 3 month old puppy. This went on for the first few days that Emi was with us so we could figure out how long she can hold it. We had one poop and pee incident each during the first week but we quickly adjusted to each other's schedules after that. She would only poop and pee on grass so we worked a visit to dog-friendly grassy areas during our neighborhood walks. This was a little difficult because Shio already knows his commands and would often demand that we give him a treat when we wanted to focus on Emi. To this day, Emi only knows basic commands (sit, paw, lie down, and recall) whilst Shio knows a whole bunch of other tricks on top of the basics. We handled it just by alternating commands for each dog. Emi would paw and get a treat, then Shio would paw and get a treat. When it became particularly annoying to have Shio paw my face 100x when Emi was learning, I'd take her into a room that Shio won't step foot in, the bathroom, and teach her in there. Luckily like most Shibas, Emi is a quick learner and it took little time. Shio's refusal to enter the bathroom helped us though trying to give him a bath is another story! This became a little tricky for us. With Shio, we've been lucky enough to only take him for basic visits but after Emi arrived, we've taken her to the vet a couple of more times due to the fact that she's clumsy. We wound up adding her to Shio's existing pet insurance plan and she's more than paid for the plan in full for the year already. We learned that with two dogs, you need to worry about illnesses and not as much accidents. What I mean by this is that if one dog gets sick, the other has a higher chance of getting sick. If one is accident prone, it's not likely that the other will need to be taken in to see the vet as well. Otherwise for basic care, it's doubling the cost for wellness shots and routine visits. Some of us will be lucky and only need to make one visit to bring both dogs for routine visits but others will need to make separate trips for each dog. I've covered what I think is most important with stories of how we experienced it and hope that you'll find it helpful. After the initial bumps work themselves out and the pups spend every morning and night playing or cuddling together, having two Shibas are such a wonderful thing. Just make sure that you realize that your productivity level will drop dramatically because all you'll want to do is play with them! I'd love to hear stories from readers who already live in a 2+ dog homes, especially if there's something I missed!